Yes I'm back again with the next yawn fest that is the chrome grill fitting guide to both annoy and bore you with. Warning! I appear in some of the pix, anyone of a nervous disposition should hit the back button in their browsers now! This is for the Mike Satur grill set, but it will be the same for any other rear grill for the TF. This is again, written for those with not much knowledge on working on cars. Don't forget to look for the for hints n tips along the way. Enjoy! 1. If you haven't got any fixings with your grill, like the Mike Satur one, you will need to buy 2 packs of "U" type nuts HFX113 (no.6/no.8) and 1 pack of Pan head screws HFX136 (no.8 13mm) from Halfords. While in Halfords, buy a tube of liquid thread lock too if you haven't any. 2. Tools you will need are only a pozi drive screwdriver, a right angled pozidrive, socket set 1/2" or 3/8",and a torx bit TX50 (again, available from Halfords). 3. Open the boot and pull out the light (falls out), and remove the bulb by twisting it and pulling it out. As the boot will be open for some time, you don't want the battery running flat! 4. Remove the pozidrive screw and its washer on the lower front edge of the rear bumper, and the same on the other side. A "right angled pozidrive" screwdriver is ideal for this. If you cannot get a screwdriver to fit, then the wheel will have to come off to facilitate access!! Best get a screwdriver to fit! 5. Remove the pozidrive self tapping screw located in the wheel arch in the top of the rear bumper. There's a small cut out in the moulding to help you see it! Repeat for the other side. If you look at the piccy, and follow the screwdriver upwards, this points to where the screw is located. 6. Using your torx bit and drive, remove both torx bolts located above and to one side of the exhaust outlets. A 3/8" drive is much easier to use for this part of the job being much smaller than the 1/2" drive. 7. Working inside the boot now....pull back the carpet from the rear bulkhead for access. Disconnect the number plate lighting cable by pulling apart the connector at "b" then pushing the rubber grommet AND the cable out of the hole towards the back of the car. Do this for BOTH cables. 8. Undo and remove the nut located below the rear light cluster on both sides. 9. Finally remove the centre nut located below the boot lid catch. Yes it is a different size to the other two nuts! 10. Make sure you have a piece of carpet or plenty of dustsheets all ready to place the bumper on. No simply slide the whole rear bumper backwards and away from the car making sure those 2 cables aren't caught on anything. This can be done on your own, but the aid of a pretty assistant makes it so much easier. I wouldn't know as she was taking pix at the time! An ugly assistant works just as good as a pretty one, only its not as good to look at. Its a JOKE!!!! 11. With the bumper placed face down on the piece of carpet or dustsheets to protect the paintwork....push on the 10 "U" type nuts. Slightly prising apart the "U" part, makes it so much easier to put them on. 12. 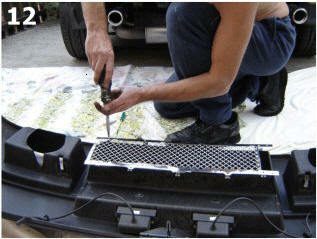 Place your new shiny grill onto the bumper cut-out. Make sure it is facing the right way e.g.." nice" side towards the bottom. Also make sure the cut-out IS located on the correct side for the towing eye to go through. In this instance on the left. 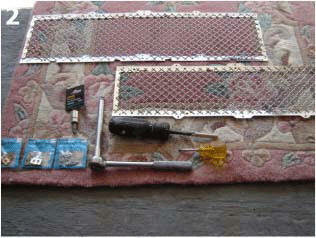 Now screw in the ten screws loosely using a drop of liquid thread lock onto the threads to make sure they never loosen. Make sure the grill is lined up correctly with the cut-out, then tighten all 10 screws. Refitting is simply a reversal of the removal procedure (You should write a Haynes Manual Spike, Ed). 1.Place BOTH of the lighting cables into the 2 holes in the rear bulkhead and feed the cable through as much as possible. 2.Offer up the bumper and line up the 3 fixing bolts on the bumper with the 3 holes in the bulkhead, and push the bumper home. 3.Reconnect BOTH cables and pull back through-into place both rubber grommets. there's a grove in the grommet which the sheet metal of the rear bulkhead fits into. Push back into place the boot carpet. 5.Loosely refit the large pozidrive screw with a drop of thread lock on it, back into the hole at the top of the bumper (See Step 2,no.5 pic),line up the bumper with the surrounding body work and tighten. 6.Loosely refit the small pozidrive screw and washer, again with a drop of thread lock on it, back into the lower forward edge of the bumper, and tighten fully. 7.Refit the bulb into the bulb holder, by lining up the pins and slots, pushing in the half a turn to "lock it". Just like changing a bulb at home! 8.Turn on your side lights and check that BOTH number plate lights are working. Don't blame me if they're not!! WARNING>It is HIGHLY advisable to use liquid thread lock on the pozidrive screws that hold the bumper on, as these tend to work loose, then drop out onto the rear tyre, causing you to have a blow out! I know of two occurrences of this happening. Now stand back and admire your new rear!! Does that look better or what! I rate this job as a 3 spanner rating, as not everyone has access to a socket set, otherwise anyone whose handy can do this job easily, and so it would warrant only a 2 spanner rating. Blind rating is high at 4 shades, as you cant miss the rear grill, it really does stand out. So its not suitable for everyone. Please note, there are some TF's with 5 hole fixings. This is normal. Same procedure as above, but only use the 5 fixings. A rear grill can be bought on its own to match the standard grill set as found on a TF, from MGOC, price about £70ish.To match it to the black grills, simply spray it with grey primer, the a couple of coats of Halfords Satin Black Spray paint. Matches perfect then. Black grills are no longer available and no longer listed, according to MGOC, only the "bright grill" is available now.